* Fruity kick for the intro with berries, plum, and a sweet citrus. * The berries stick around and are joined by a melange of florals. * Just as we say fruit salad for a generic, indistinct jumble of fruit smells – ‘melange of florals’ would be my polite way of saying floral salad. * The florals last for a couple of hours before fading a bit. * The base is described as vanilla gelato and sensual musk. Let’s skip the fancy talk and just say the base is vanilla and amber with a light musk in the mix. Summary: I haven’t been that impressed with the recent Bond No 9 fragrances (Parfumista Ave and NY musk) but for some reason the I Love NY scents seem to work better on me (and are at a cheaper price point). I don’t get the holidays from this scent but that is not necessarily a bad thing – because if it was pine, cinnamon and fruitcake – the scent would be TOO specific to be worn for the holidays. As it is, it doesn’t stand out from many of the designer fruity floral scents that dominate department store scents, but since it’s at a similar price point, has the iconic I Love NY logo on the bottle, and says “holidays” – it makes an obvious gift for anyone on your holiday list. The compliment I want to pay it is that it is inoffensive and universal – but that sounds backhanded, which isn’t my intention. Longevity is good for an EDP, lasting about 8 hours on my skin before it turns into a subtle skin scent. 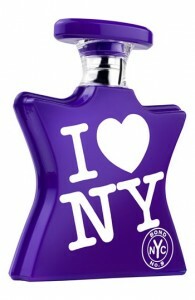 Bond I Love NY for the Holidays is available at Sephora, Nordstrom, Saks 5th Avenue and the Bond No 9 Website. Disclaimer: Sample provided by department store. Picture courtesy of Sephora.